The United Kingdom (UK) will leave the European Union (EU) on 29th March 2019. Whilst there is little certainty around Brexit there are practical guides to help mitigate the risks and maximise the opportunities of Brexit as well as up to date information about how the UK’s departure will affect businesses and individuals and what to do to prepare. These guides provide the practical information businesses need to prepare themselves for how and when they need to act ensuring compliance with any changes in law or regulation that will affect them. 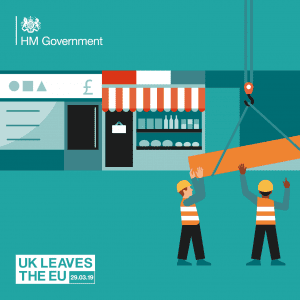 Get the latest information at the prepare for EU exit website – gov.uk/euexitbusiness – which provides guidance for businesses and individuals on a range of topics concerning leaving the EU. You can use this information to understand how leaving the EU may affect your business, or as an individual, and what you can do to get ready. Government has produced a tool to help businesses prepare for the UK leaving the EU. The tools poses 7 key questions to deliver guidance relevant to your business. The Border Delivery Group and HM Revenue and Customs (HMRC) have published a series of short videos and leaflets to help businesses prepare for changes at the UK/EU border in a ‘no deal’ scenario. The videos set out the actions that businesses will need to take to continue to trade in a ‘no deal’ EU Exit, and direct them towards further information available online. Along with a general video and leaflet for all businesses, there are tailored products for specific industries. There are also two deep dive videos available that provide more detail on importing and exporting in a ‘no deal’ scenario. The videos are all available here, and a toolkit will soon be available online with the full range of materials and advice on how to use them to engage with businesses. Do you buy goods from overseas? Defra will continue to provide further information and guidance on other topics that may affect businesses should we leave the EU without a deal. Trading with countries outside the EU – get prepared, get your EORI number! HM Revenue and Customs (HMRC) has written to 145,000 VAT-registered businesses trading with the EU about simplified importing procedures and also updated them on the actions that they need to take to prepare. Transitional Simplified Procedures (TSP) for customs will make importing easier for an initial period of one year, should we leave the EU without a deal, to allow businesses time to prepare for usual import processes. Once businesses are registered for TSP, they will be able to transport goods from the EU into the UK without having to make a full customs declaration at the border, and will be able to postpone paying any import duties. Businesses can apply from 7th February. If you’re based outside the EU you need an EORI (Economic Operator Registration and Identification) number to trade goods with the UK. DfE recently published guidance to support the FE sector to prepare in the event of no deal being reached. The guidance signposts education institutions to relevant information, setting it in the context of how it may affect the education sector. Our Growth Hub programme; East Sussex, Essex and Kent, is your first point of contact for business support. It brings together the best of public and private sector partners to promote, co-ordinate and deliver business support based on local need. Growth Hub business navigators spend a lot of their time researching all of the support that is available to businesses and working with businesses to ensure that the best advice is given to businesses.